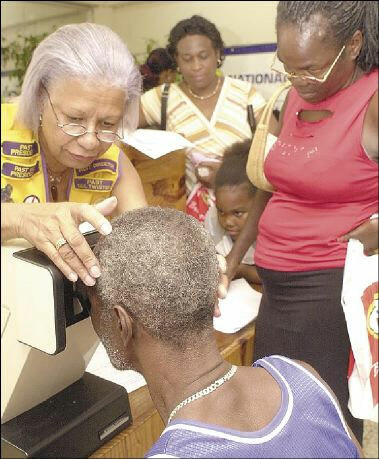 Brenda Scarlett of the Lions Club of St Andrew Central assisting Laurie Pryce to adjust his head to the vision tester at the Diabetes Day Health Fair at the Diabetes Centre on Downer Avenue recently. Caption: Woman In Red blouse: " Watch im!...a look you fi look ina di sinting!" Woman assisting: "Lourd, what I have to deal with...strenghten me for it Lourd"
Caption: Umm...You're right. The head you currently have doesn't fit your body. Caption: ah wha kinda tv this, mi nuhseenuh pitchaah juswhole heap ah gibberish pon de screen. Caption: AAHH "This caption captures the true essence of what Jamaicans are all about, helping to care for the less fortunate." Caption: U see I already dun tell him say his head shape wont fit, nu badda squeeze it please...! Caption: Mi a go si mi fuucha? Caption: Lady in pink: A weh she a do wid him? she think she a go put my head ina dat deh contraption? Caption: Tek time wid mi head, nuh.